Deb and I just got back from our trip to Thailand. We wanted to take a "big trip" to celebrate our 25th anniversary, so I convinced Deb that a trip to the southern part of Thailand would be a great place to go. There is an area on the Phra Nang penninsula that has incredible rock climbing, warm clear waters, and beautiful beaches. I had read about this area in rock climbing magazines and had talked to a couple of local climbers who ventured there in the past and they had good things to report. We started out in St. George at the airport. We flew to LA, then got on a plane going to Seoul Korea then another plane to Phuket Thailand. We arrived in Phuket about midnight (30 hours later!) and bargained with some taxi drivers. We hired a young guy to drive us for 3 hours to the coast to a place called Ao Namow where we were to catch a boat out to our final destination. Arriving at Ao Namow at 3 am we found this small place quiet and shutdown. The taxi helped us find a hotel at which we payed for a room for a few hours until morning. This hotel turned out to be a nice place with a friendly family running it. After they fed us breakfast, they helped us carry our bags over to the beachfront where we did catch the "longtail boat" out to Rai Lay beach where we stayed for the next 7 days. Railay and Tonsai beaches are known for the limestone towers covered in jungle and the beautiful shallow seas surrounding them. Because of the mountainous terrain and jungle, there are no roads or airstrips there and arriving by small boat is the only option. In spite of this, this area is popular with many Europeans and of course rock climbers. Several beautiful and exotic resorts are being built there now and we stayed in one of them. We had a bungalow to ourselves and had top-of-the-line service the whole week. Deb and I indulged in several Thai messages and sampled exotic fruits and Thai dishes throughout the week. For the dirt bag climbers, there were very basic wooden huts in the jungle hills surrounding Tonsai beach. A couple (if they wanted to) could stay in those small bungalows and eat well for probably $25 dollars a day. You would have to share an outdoor shower and bathroom with several other euro climbers and brave the bugs typically found in tropical areas. 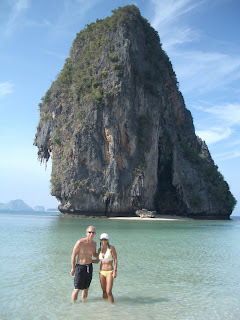 But Deb and I stayed on Railay beach at the resorts instead. We still got out and rock climbed most every day. Our afternoons were spent on the beaches and exploring some jungle trails in the area. One rest day ( one can only climb so much) we hired a boat to take us out diving. While I dove with a Thai dive master, Deb snorkeled above us. It was a great day that was made adventurous by the breaking down of our boat on the open sea on the way back from our dive sites off of Chicken Island south of Railay. The boatman simply pulled out his cell phone and called a friend who came out with his boat and towed us in. It was a good thing the the seas were relatively calm that day. The rock climbing was excellent! Many of the climbs are on overhanging cave-like rock faces right off the beach. 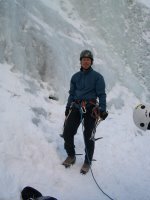 At first I found the climbing to be challenging and difficult, but as I became accustomed to the climbing style and ratings, I found some incredible routes that I will never forget. Routes with names like Monkey Love, Groove Tube and Don't Worry be Happy. My favorite route was on Happy Island which required a 100 yard wade through waste deep water during low tide to get to the base of the cliff. Deb was a great sport and did a lot of the climbs herself. I think she got into it a bit more than she would like to admit. It sure was fun and relaxing to wake up each morning and have a breakfast loaded with fruits, go climbing for a few hours, then retire to the beach for the afternoon followed by a leisurely dinner in an open air restaurant at beach side sampling new and tasty meals. As expected, we hated to see it end. The trip home was agonizing and took longer than the trip to over. We had plane changes in Seoul Korea, Tokyo Japan and Los Angeles. LA was the worse link in the travel itinerary and should be an embarrassment to Americans everywhere. It was very nice to get back home to our kids and Siena. St. George is a beautiful place to live and coming home is nice too! Now it is back to work and the daily grind, but Deb and I think this was our best vacation yet. So we did have a memorable 25th anniversary trip after all.